There are few things that can both live in classic and contemporary kitchen worlds but one of them is a clean, white kitchen. It doesn’t matter whether you are planning a new kitchen in a bygone, farmhouse style or conversely, with a sleek, modern look, a white kitchen can make the space feel clean and fresh, adding a perceived dimension of space to even the smallest of areas. It’s always important to plan ahead but it’s not that difficult to obtain all the materials required for an ice white kitchen look. A fireclay sink is possibly the best choice, as it’s resistant to scratches and staining, whilst being easy to clean. Another option is an enamel-coated cast iron sink, which is very durable but requires strong cabinets to support the weight. 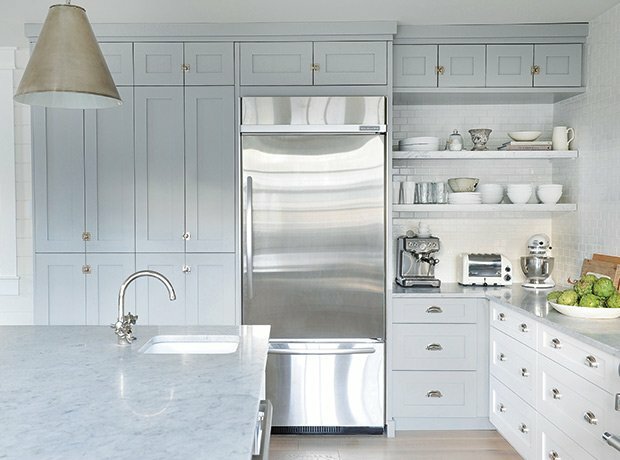 White fridge styles can vary to fit any modern or classic style whilst white cabinetry is among the most varied options on the market. White subway tiles add a touch of class whilst there is a fine array of white material options for kitchen worktops. Quartz worktops are fast becoming the most popular white surface for consumers and designers. Coming in a variety of patterns, there is an almost unending choice of quartz worktops. Furthermore, quartz is one of the hardest substances on earth and is resistant to scratching, chipping and staining and being non-porous it is a very hygienic substance for white kitchen worktops. Even those homeowners, who are focused on a pure white kitchen, can still have their creation benefit from a hint of colour, to contrast the whiteness of: cabinetry, shelving, appliances, sinks and kitchen worktops. Perhaps an all-white kitchen with a dark wood floor or a hint of lime or red on the window panels, can add a touch of contemporary class to this clean, white finish. Even adorning the pure white island with dark stools can just give that much needed warmth, and will avoid a cold, clinical, even surgical look that should be avoided. White kitchen worktops are the favourite concept for homeowners, interior designers and architects today. There are so many choices, styles and materials available to suit any taste, especially when there are kitchen specialists on hand with their creative and innovative collections to turn dreams into reality.